Objective: Since 2006 we have incorporated minimally invasive (MIE) esophageal resection in our operative armamentarium in the surgical treatment of esophageal cancer. The aim of this study is to examine trends in operative technique, extent of resection including lymphatic dissection and post-operative outcomes with increasing surgeon experience. Methods: All patients undergoing esophageal resection are entered into a prospectively maintained database. Database was queried to identify patients who underwent MIE. Trends in operative and post-operative data were analyzed as the surgeon’s experience with MIE increased. 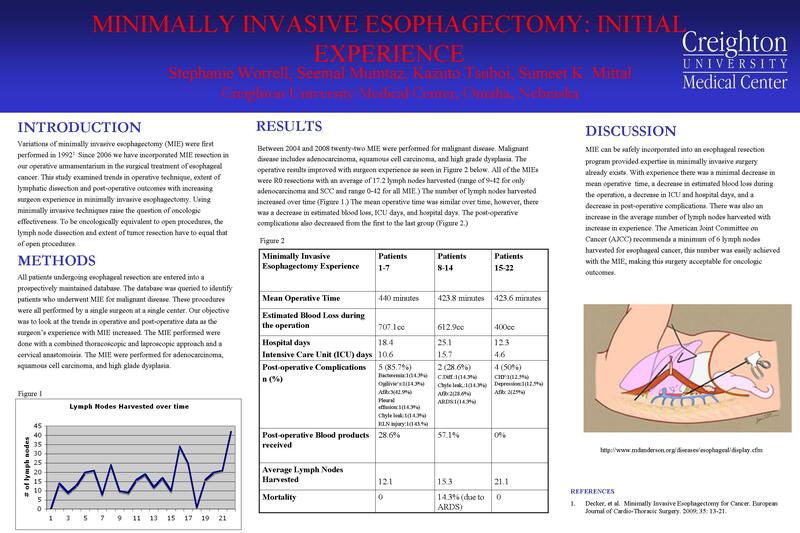 Results: Twenty-two patients underwent MIE resection from 2006-2008, during the same period a total of 71 esophageal resections were performed. There were two conversions in the first four patients. Mean operative time was 431minutes, with no significant change over the period of study. There was a noticeable decrease in EBL, post-operative complications and ICU stay over the period of the study. All patients had an R0 resection and the average number of lymph nodes harvested increased from a mean of 11.2 in first 5 patients to 20.8 in the last 5 patients. There was one mortality (4.5%) due to ARDS. Conclusions: MIE can be safely incorporated into an esophageal resection program provided expertise in minimally invasive surgery already exists. With experience there was an increase in the number of lymph nodes harvested. There is also a decreased incidence of post-operative complications, ICU days and EBL with experience.